Rugby Challenge 2: The Lions Tour feels like an improved version of its predecessor, but are its tweaks and upgrades worth paying full price for? We want to love Rugby Challenge 2. We want to unguardedly praise it to the heavens and heartily recommend fans of this sport splurge on a copy forthwith. The reason for this is entirely selfish: we like rugby and feel that it's under-represented in video games. Every year FIFA, Madden and Tiger Woods games swagger into the market, but rugby sims are thinner on the ground. Unless Rugby Challenge 2 The Lions Tour sells well, it may be a while before we see its like again. Still, we can only really suggest punters pick up a copy of Rugby Challenge 2 if they're either enraged Australians who want to virtually set the world to rights after the recent Lions tour, or if they never played the first Rugby Challenge game. The reason for the latter is simple: much of Rugby Challenge 2 is standing on the shoulders of its predecessor. That's both good and bad, mind. Unlike the incredibly patchy official World Cup Rugby tie-in video game of 2011, the original Rugby Challenge offered a very decent gaming experience. Its controls were superb, its on-pitch action was almost as layered as its real-world counterpart and although it lacked a lot of official team licenses, its career and tournament modes with both deep and rewarding. Developer Sidhe has kept a lot of Rugby Challenge's controls and mechanics in place here, and implemented some rather necessary changes. Players can now, for example, get a bit feistier in a ruck, although if they hammer the button to contest the ball, the ref will blow them up for it. 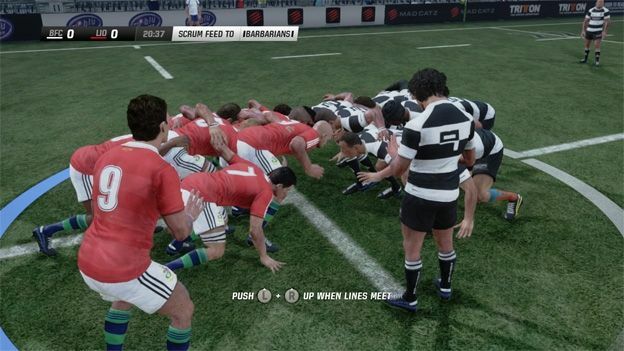 Scrumming feels more organic – you can no longer shove your opponent's pack off the field with some nimble thumbstick flicking – and box kicks and chip shots have been vastly improved (ie you now have some chance of catching them). Sidhe have also implemented to option of using in-game back-line strategies, although the exhaustive tutorials don't really explain how to use them very well. Kicking hasn't been touched much, which is both a blessing and a curse in a player-to-player game as finding touch and place kicking are both quite laughably easy. Other faults from the first Rugby Challenge persist as well. The character models still look sub-par and the soundtrack is still awful; crowd noises are still generic and convey no sense of match atmosphere and the commentary is lousy. The game's biggest problem, though, remains its lack of licensing, which is a shame, because it's clear that in it's the game's career and tournament modes where its true longevity lies. Rugby Challenge 2 offers a couple of tweaks and upgrades on its predecessor's template, but doesn't exactly evolve the series in the way, say, FIFA manages with every iteration. It's not a terrible game – indeed it's the most solid rugby experience you're likely to get on a console – but it doesn't really feel like it's moved on substantially from its predecessor. Here's hoping the next-generation of consoles delivers the much-needed jolt the series needs to take it to the next level.